Trip report : Arizona pool back in bussiness - yea! I camped out at the Freedom trail parking lot last night. So, early in the morning I woke up and fixed myself some grits and eggs. I ate so much I had to delay my trip to the springs due to my bloatted belly. While waiting for this some twenty some things showed up and hung out with me. I explained my delima to them. Then asked them how they came to this place. They said " they had a run in with the wierdo at that little shack. " "Oh really? " I said ! "Yes" he said "He had lived in Hisperia 16 years and only found out about the springs a few months ago. So a few months ago he found the Freedom trail and on his way back when it was hot he got lost and found the Bowen Ranch. As he approached the ranch a wierdo yelled at him 'to get off of his property' while putting his hand on his gun. He yelled back to him that he was lost and needed help. The wierdo yelled back 'get off my property and stay out of here.' while putting his hand on his gun as if he was about to use it scareing him. " Wierdo was a discriptive term he used for Mike Castro as near as I could tell from the way he described the guy at the gate. At least the wierdo let him get a half gallon of water while some campers explained how to get back to the Freedom trail. I explained to him that he was not too wierd, just anti social. The guy got so worked up and angry explaning how he was almost endangered by him. He got back in his 4x4 and went back home. Explaning his wife and daughter only had flip flops and needed some hikeing shoes. So as I got to the springs a group of guys who have been camping at the springs the past month were on the right camping again in some hammocks. They were drinking beer and smoking some kind of herbs at 8 am. What a life that must be. A group of ? 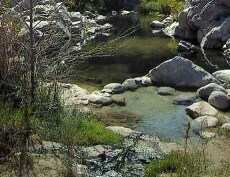 Samoans were camping up stream @ 100 feet up stream from the Arizona pool. They were not hung over as the were speaking a foriegn language very load. Also, they were yelling and doing load bird calls. Kind of annoying. The water in the creek was cooler this week than last week. Last week the water was above 80 this week it was not. It was @ 3 feet deep at the rope. All temperatures are a guestimate as my thermometer broke in the Vegas heat, that is why I was at the springs this week. The big pool is as clean as it gets. It is more than 7 feet deep now, but some new boulders made it easy to stand for a 6 footer like me. I had planned to work on the Arizona pool some more. As last week it was @ 4-5 inches below capacity. That is from over flowing where it used to. When I examined it today, some body had put some sand bags over where it had been leaking out and it was over flowing again. It was very rewarding to soak there again. Thank you to who ever did this good deed. This freed me up so I spent most of my day talking to a beautiful physics major from UCLA today. She was prettier than the day is long. She was not only pretty on the outside but pretty on the inside too. Her mother was very nice also. The kind of women that make you happy to while away the time at this wonderful oasis in the desert. Happy hot potting every one !